Platform frame where walls are assembled on site into storey[for the purposes of part B (fire) of the Approved Documents to the Building Regulations] this includes - (a) any gallery[for the purposes of part B of the Approved Documents] - A raised area or platform around the sides or at the back of a room which provides extra space. if its area is more than half that of the space into which it projects; and (b) a roof, unless it is accessible only for maintenance and repair. height panels and errected and then floored over. This then forms the basis to build the next floor on top. Post and BeamSubstantial, usually horizontal structural member., where timber posts and beams are fixed together on site and then the walls are filled in using studwork and sheets or infill. 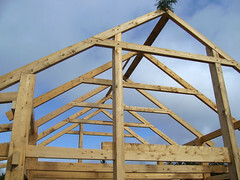 The floors and roof are fairly traditional, using joists (or trusses in the roof). Post and beam can cover anything from the traditional oak timber frame type of building used over many hundreds of years right through to methods like the Walter Segalrefers to a simple self build timber frame form of construction pioneered by the architect Walter Segal. see details of the systemThe architect who devised a simple timber frame self build system (often simply known as 'Segal self build'). see more on the Segal method approach which utilizes standard softwood sections and standard panel sizes. Roundwood framing is also a possibility (as exemplified by the Grand Designs episode showing Ben Law building his cottage). It is hardly a green option to use the traditional oak frame building method in the UK because there is not actually that much oak available. It takes a lot of oak trees to build a house and there has been limited planting of oak over the last century. Furthermore, green oak, which is normally used for such work is notorious for moving (rather than simply shrinking) as it dries in situ. Frames can easily move 50mm out of true (especially when winding and twisting occur) over the first few years and this makes it almost impossible to draught proof joints between the frame and the cladding or internal lining. Air tightnessA measure of how leaky a building is to air. In other words, how draughty it might be. There are now standard fan pressure tests to check how air tight a house is and the Building Regulations have minimum standards for all new houses (L1A – Conservation of fuel and power in new dwellings (England)). A much higher degree of air tightness is covered by the Passivhaus standard is becoming one of the major issues for energy conservation. Sealing timber frame houses made of stable kilned softwood is difficult enough. Green oak is almost impossible due to the large number of splits which develop. An interesting example of problems experienced in achieving air tightness is in an AECBthe Sustainable Building Association article on low energy houses at the Greenoak developments. A third problem is the cold bridgingthis is a pathway where heat can easily escape (or get in) through some part of the structure. It is usually caused by some element of structure such as a steel lintel or wooden studwork. Also known as a thermal bridge. see more on cold bridging introduced by the large sections involved. So oak frame is really a nostalgic distraction rather than a green building option. The first three of these methods offer the advantage of fast erection on site, possibly only a few days. This is useful for getting the building watertight quickly. The post and beam method is slower but more flexible, allowing minor changes to be incorporated as the work proceeds. More of the cost is in site labour and lends itself to self build in the sense of using your own labour. Of course, with prefabricated kit construction the pricing is more predictable for two reasons. Firstly you can get a fixed price beforehand for both the panels and for their erection. With post and beam you will be relying on estimates calculated by your architect, possibly a quantity surveyor, contractors and sub contractors, etc. Materials might vary in price as you proceed with the work. One of the problems of designing post and beam houses is that almost all the text books are out of date when it comes to high insulation levels. Usually they show up to 100mm of insulation and the studs tend to act as thermal bridges. Until recently it was assumed that the proportion of timber in a wall was less than 10% when it can often be up around 25% when you include all the noggins, spacers, sole plates etc. When you require something more like 300mm of insulation without thermal bridgingthis is a pathway where heat can easily escape (or get in) through some part of the structure. It is usually caused by some element of structure such as a steel lintel or wooden studwork. Also known as a cold bridge. see more on thermal bridging (which may well be the case for PassivhausSee more on the Passivhaus standard. The PassivHaus Institute has pioneered a standard for low energy buildings. It includes very low energy usage and ways of achieving this. The word is derived from the idea of buildings which are fundamentally low energy and passive solar heated rather than using extra gadgets to heat them. See Passivhaus for the UK branch of the organisation. standard) you have to go for engineered I beamsprefabricated timber beams with a web of OSBOriented Strand Board and softwood flanges. They are very light, efficient and regular with their thin webs. Considerable skill needs to go into the detailing of eaves, around openings and at the junction of the ground floor with the wall in order to maintain good insulation. Also there needs to be an approach to air tightness which utilizes membranes or sheet materials which are in simple planar configurations with uncomplicated joints. In the BREBuilding Research Establishment. Green Guide to Specification timber frame rates very highly in most of its forms of construction. The internal lining might be plaster board or a clay based lining board or possibly timber (depending on spread of flame requirements for the building regulationsThese are the mass of regulations that cover safety, health, welfare, convenience, energy efficiency etc. in the way buildings are constructed. Not to be confused with Planning consent (which is more to do with whether you can put up the building in the first place). See more on the regulations ) fixed onto timber spacer strips to allow for service runs. The space can vary from 25mm if it’s for electrics only up to about 40mm if it needs to allow for plumbing. The OSB boarding (usually 11mm) is a greener alternative to plywood and can be fixed directly to the I beams so that the joints are supported and there is no chance of air leakage. The insulation can be placed in situ before the OSB is fixed. This is easy with mineral fibre insulation but cellulose needs applying slightly damp and it needs to be done by an experienced contractor. The sarking boards need to be vapour permeable and are fixed directly to the I beams, similar to the OSB. Foil faced sarking cuts down on heat loss by radiation. Horizontal softwood battensNarrow strips of wood. Roof battens are narrow strips used to fix slates and tiles. Also used for tile and slate hanging on walls and rain screens (probably at 600mm centres) then provide a fixing for the final wall finish in the form of a rain screenthis is a (usually thin) outer cladding on a wall which prevents rain, snow, etc getting at the structure of the wall behind. see more on rain screen. This gives a total wall thickness of about 440 mm which is not excessive in terms of footprint. Nor does it cause problems with excessively deep windows. There is very little thermal bridging through the webs of the OSB beams (compared with normal timber stud work which does actually increase the heat loss quite considerably. The I beams may not be needed if the panel is simply infill and not structural. In that case they can be substituted by OSB spacers which would be cheaper and easy for any joiner to run up. Note that external insulation can be added to an existing wall with a similar detail using OSB, battens and a rain screen. Passivhaus Homes with their “PH15 System, a timber framed solution, designed to simplify all the technical aspects of building a Passivhaus, enabling you to create your energy efficient home, one that will be fit for now and the future”. Note that compartmentationa term used in the Building Regulations to denote fire resistance between two parts of a building (such as a compartment wall or compartment floor) or between one building and another (for instance a party wall), can be achieved using timber frame construction clad in plasterboard or a similar none combustible material. The degree of sound insulation required within and between houses and flats is covered in Part EThe Approved documents, (England) part E, deals with resistance to the passage of sound of the Approved Documents. Thanks for your comments. You are quite correct on the shrinkage figures you quote but the 50mm I referred to is not shrinkage but total movement. That is, the movement which can occur through twisting and bending of the timber as it dries. This can cause movement of the structure as a whole and put the frame out of alignment. 50mm might be on the high side but 25mm would certainly be considered normal over two extremities of a large house. This is the sort of movement which could tear or loosen joints on an air tight membrane. As we approach 2016 and zero carbon standards, air tightness becomes critical. With timber frame construction generally it becomes very difficult (but not impossible) to ensure air tight joints between posts, beams etc. and the surrounding surfaces. Taping to oak, which will probably split in the future is not realistic for the long term. Using a continuous vapour control layer/air tight membrane usually entails a lot of complicated joints where walls, roofs etc meet. Relying on membranes which get covered by other materials is a problem because if the fan test fails then how do you locate the problem? Enter ‘Allowable Solutions’ at this point. Sorry about the ‘about’ page. We are busy rearranging the site menu system and this page is about to go. Your comments on air tightness and timber frame, both stick frame and heavy structural timber frame, are very bias and quite misleading. Airtightness has almost nothing to do with the building materials used and everything to do with design detailing. You will get more air leakage from a single incorrectly installed uPVC window frame in a masonry built house than you will from a well detailed and professionally designed and build green oak structure or timber frame build. Cold bridging is an issue with timber frame if you have exposed members that bridge from inside to out. This is only a real issue in mock Tudor style timber frame. It is an issue with any building material that bridges though. In fact timber has a lower rate of heat loss than other traditional building materials like brick, stone, concrete or steel. If any of these form a cold bridge the rate of heat loss for an equal surface area is significantly higher. The conductivity of hardwood of a desity of 700kg/m3 (green oak is about 950kg/m3 and dries to around 690kg/m3) is 0.18W/mK. Softwood at 500kg/m3 is 0.13W/mK. Brick at 1700kg/m3 is 0.84W/mK. Concrete at 2200/m3 is 1.59W/mK. Steel reinforced concrete at 2400/m3 is 2.50W/mK. These figures are quoted from the Building Construction Hand book by Chudley and Greeno 9th Edition. You have taken your 50mm shrinkage from TRADAs Green Oak in Construction book but you have used it in quite a misleading manner. The calculation used to achieve this MAXIMUM settlement assume a total of 1250mm of cross grain timber over a 2 storey traditional jettied build. This equates to the more accurate estimate of 4% across the face of a horizontal member. The huge majority of builds have closer to 500mm of cross grain timber over 2 stories. This would equate to closer to 20mm of vertical settlement. Vertical members have negligible shrinkage along the grain of 0.01%. Assuming 2 storeys of 2300mm this would give 4.6mm of shrinkage. These issues are not unique to timber frame. All buildings go through an initial settlement followed by seasonal settlement. Although this is more pronounced in timber frame builds the design and detailing of the overall build allows or these initial and seasonal changes. If you are going to make bold claims about a number of building methods you really should properly research the subject in an appropriate manner and lease with experts in the field. You appear to want the site to come across as an authoritative and experienced source of information but the About page is void of anything bar an email address and sitemap. Is any of the content of the site more than mere opinion?